One of the constant accolades Pixar receives about its movies is that they’re not made just for kids. This is meant as a compliment: While they’re animated and appeal to children, their emotional and thematic sophistication also makes them satisfying to grownups—maybe even more so. The downside to those hosannas is the implication that cartoon movies geared just to kids are somehow inferior. Sure, the Ice Age flicks mostly serve as babysitting tools for exhausted parents, but a good kid’s movie can do more than just be a shiny, flashy distraction to keep tykes occupied—even if they’re not as complex or as witty as, say, Toy Story. That said, The Good Dinosaur is very obviously a movie made for little-kids, pitching its life lessons in a way that, at first, feels very alienating for anybody over the age of 17. This isn’t an emotional blitzkrieg like Inside Out or a grandly ambitious effort such as Wall-E but, I wouldn’t be shocked if, 15 years from now, a generation of budding film-lovers points to The Good Dinosaur as one of their formative childhood viewing experiences. It’s aimed at kids, but it doesn’t treat them like children. If you’re patient enough to sit through it, you’ll see how. The film exists in a parallel timeline in which the meteor that hit Earth 65 million years ago, and wipes out the dinosaurs, never actually makes impact. In this fantastical history, we meet a family of Apatosauruses who are tending to their farm, and their youngest son Arlo (voiced by Raymond Ochoa), who is a timid, naive little dinosaur. Arlo encounters a lost human child nicknamed Spot (voiced by Jack Bright), who is practically a wild animal for all of his grunting, barking, and the fact that he walks on all fours. The family considers Spot a pest, but after a terrible flood both kills Arlo’s beloved father and distances him from home, he and the human must work together to get back to his family. Not unlike those Homeward Bound films where a collection of animals brave the wild to get home, The Good Dinosaur focuses on the beauty and terror of nature, often at the expense of the movie’s protagonists. Arlo and Spot run into some humorous characters along the way, a common trope in films like Finding Nemo or Inside Out, but first-time feature director Peter Sohn (who also developed the story) seems to intentionally keep the storytelling more primitive than Pixar’s past efforts. By comparison, The Good Dinosaur makes even the studio’s relatively docile movies like Cars look hyperactive: There aren’t any major surprises, and the film plays out as you’d expect with an almost tranquil grace. Even if The Good Dinosaur doesn’t reach the inspired heights of Pixar’s finest films, it’s surprisingly moving and gorgeous in its own right, enough so that it doesn’t worry about feverishly entertaining us at every turn. For all the praise Pixar rightly receives, sometimes the company’s movies’ verbal wit overshadows its extraordinary visual splendor: The Toy Story films are so hilariously clever that it’s easy to forget how flat-out gorgeous they are as pieces of animation, for example. The Good Dinosaur does the opposite—it’s among the studio’s quietest features, and lets viewers soak in the stunning mountain landscape that Arlo and Spot traverse to find Arlo’s family. As much as I love Pixar’s films, I don’t think I’ve ever been quite so enveloped by one of their worlds as I was here: Sohn wants us to revel in the untapped lushness of a planet that hasn’t yet been ravaged by human beings. There are certainly terrors to be experienced as well, and the movie is wise enough to remind kids that the big, bad world has plenty of scary things. (For Arlo and Spot, it’s a group of mean pterodactyls who want to pick their bones clean.) 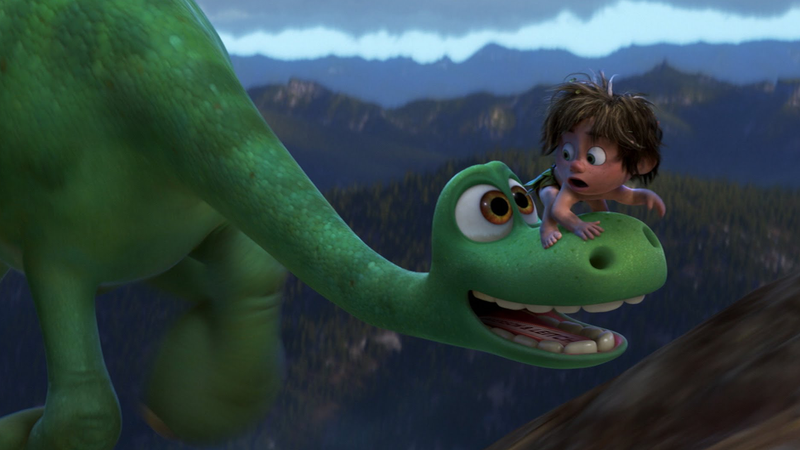 Although the film can be too simplistic—I can’t recall a single funny line or particularly great piece of character work—The Good Dinosaur keeps a sharp eye on its tried-and-true themes: learning to accept other people’s differences, appreciating the value of family, stepping out of the shadow of one’s parents to become your own person. And if you’re open to the movie’s modest but touching resonance, The Good Dinosaur will get to you. Most Pixar films are designed to enrapture adults and leave parents eager to share the magic with their kids; this one is the other way around.